Among the new breed of Tamil filmmakers, one director who stands tall is Vasanthabalan, director of excellent films like Veyiland Angadi Theru. 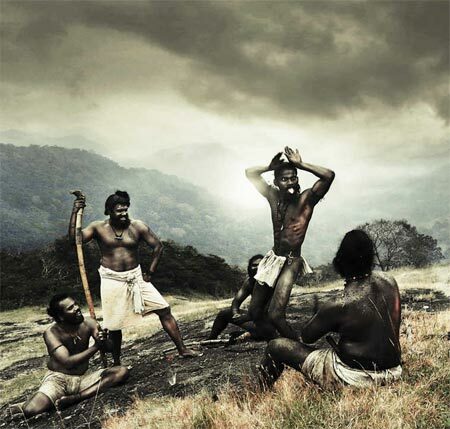 Veyil, produced by director Shankarwas also the first Tamil film to be screened at the Cannes Film Festival in 2006. It was screened under the Tous les Cinemas du Monde section which showcases films from different countries. Angadi Theru was even better than Veyil but was unlucky at the National Awards. Vasanthabalan's new film Aravaan is a period film based on the novel Kaaval Kottam by this year's Sahitya Akademi winner, Su Venkatesan.The novel depicts 300 years of Madurai's history. As Aravaan gets ready to release on March 2, Vasanthabalan speaks to rediff about his unusual choice of subject and how he shaped the film. After the realistic Veyil and Angadi Theru, why did you choose to make a period film like Aravaan? After Veyil and Angadi Theru, I have been branded as a director who makes small films. I had this strong urge to come out of it and make a big film. I thought about whether I should make an action film or a serious film or a period film. So, it was a deliberate decision to move away from realistic films to another genre. Su Venkatesan's Kaval Kottam is a mammoth work covering the 300-year history of Madurai. From such a work, how did you choose this one particular story? Actually, I was not thinking of making a film based on a book. I was preparing a script at that time. I always read all the books that come out in Tamil, and this book attracted my attention. It is a mammoth book like you said; it has more than 1000 pages and narrates 300 years of Madurai's history. You cannot make a film based on such a huge book. According to me, short stories can be better adapted to movies. Though the book had several short stories, I was impressed by one and decided to expand it. I also wanted to select a story that can be made into a movie within my budget. Kaval Kottam is this year's Sahitya Akademi winning novel but when you started making the film, it had not won the award. What impressed you about the book? It is a very serious and well researched book. It took the author more than a decade to study each and every stone in Madurai. I am happy that the book has won the Akademi award. It has increased the value of the film too. I also feel that films have wider reach than books and this movie will make people aware of such a book. In which century is the film set? The story of Varipuli is set in the late 18th century. Like the book, my work is also mammoth, in a way. It took me one year to write the script, do the pre-production work and then shoot the film. If you read the story, you will know that it has only 20 pages. You can't make a film based on such a short story. A screenplay should have at least 500 pages. So, you must have more characters and more incidents so that the film looks full. What I did was, I took the story as the starting block and from there, I moved on. In fact, the hero of the film, Varipuli, is not there in the short story; I created him. Yes, I created him and gave the name too. The short story has only a point in it; as a film-maker, I had to expand the point and give it an image. How difficult was it to find a location where there was no trace of modern life? It was the toughest job. Wherever you look, there is a mobile tower, telephone wire and electricity lines. There is no place in India that hasn't any of these modernities. We must have travelled thousands of kilometres to find such a place. Finally, somebody told us that there is a small village beyond Arithapatti in Madurai where mobile towers have not reached. That is where we erected the sets. It took our art director Vijay Murugan fifty days to erect the sets. When we spoke after you made Angadi Theru, you had said that it was very tough to shoot in Ranganathan Street which is full of people all the time. Here, you erected huge sets. Which was tougher, shooting at such locations or on such sets? Shooting Aravaan was tougher. We had to be extremely careful. A small, careless act can kill the entire film. We saw to it that nobody threw even a tea cup anywhere near the set. But I enjoyed making the film. The tougher the job, the more enjoyable it is. In many period films actresses have shaped eyebrows, manicured and painted nails. Were you careful about this too? Yes. I had told all of them not to even cut their nails. Any particular reason why you chose Aadhi to act as Varipuli? I wanted a very tall actor and Aadhi is 6.2. His physique is suited to the character. He had that extra something in him to act in a period film. I was quite impressed with his performance in Eeram. More than all that, it was availability. I wanted an actor who could devote 100 days continuously to the film. And, he has performed amazingly well. No, he is just an ordinary, simple man. But he leads the life of a warrior! What was your feeling when you finished shooting? It was very exhausting but I had tears in my eyes! What is in your mind now that you await its release this Friday? I have written the exam very well and I am expecting 100 marks! Jennifer Aniston: My 30s blew but 40s are great!